Sumio Kawakami (川上澄生) was born in Yokohama in 1895. He studied print making at Aoyama Gakuin High School. His style is sometimes ironical and humorous. Many print subjects deal with the impact of foreigners on the Japanese culture. In the 1960s' Sumio Kawakami finally gained late recognition. 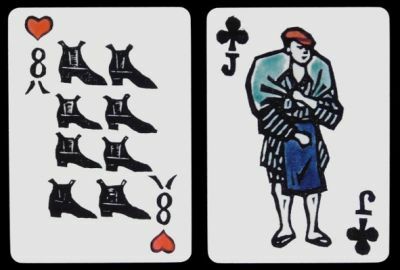 Last year, Okuno Playing Cards has edited "四季のたのしみとらむぷ ", a pack of 52 cards and 2 jokers reproducing some of the woodblocks. Each suit is dedicated to a season like heart for fall and club for spring. Each pip card has a topic like shoes for the 8. Cardmaker or editor: Edited by Okuno Playing Cards (奥野かるた店), printed by Nintendo.